Amidst all the shopping, commercials, and holiday gift guides, it’s too easy to lose the true meaning of the season: God’s ultimate gift of His son, Jesus. The gift of Jesus’s life is what we’re truly celebrating on Christmas, not all the presents you’ll open on Christmas morning. Yes, the gifts are fun and a great way to show your love for family and friends, but the material gifts are not what it’s all about. I’ve fallen prey to this, too, and I’ve spent my fair share of time reading and creating holiday gift guides, before I realized something was missing. 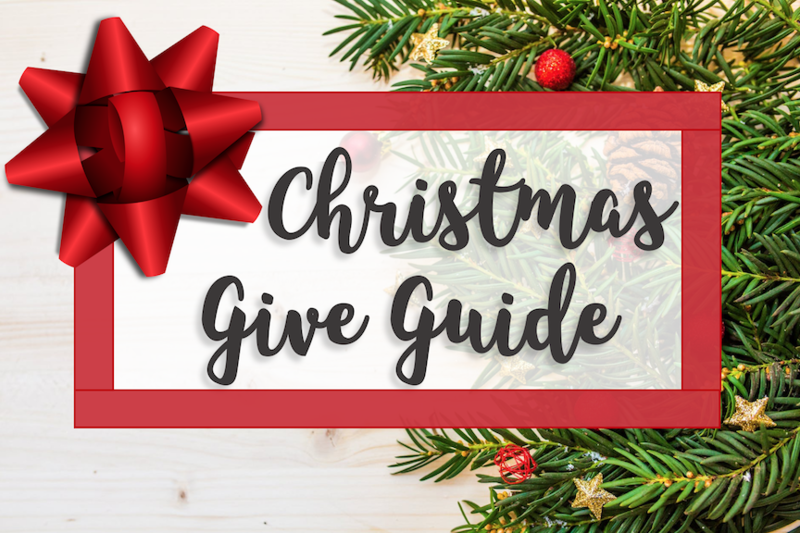 So, instead of creating a last-minute Christmas gift guide, I’m bringing you a Christmas give guide, with simple ways to give back meaningfully this holiday season. When I was thinking about writing this post, my first instinct was to dive into scripture to see what the Bible has to say about giving. Quickly, I realized there are waaay too many verses and passages on the importance and grace of giving to cite them simply. I was raised to give of my “time, talent, and treasure”, and we know that “the Lord Himself said, ‘it is more blessed to give than to receive”. (Acts 20:35 NIV). So while we’re rushing around buying presents and making sure we’ve crossed every person off our list, did we remember to find a way to give back this season? All gifts don’t have to be monetary-based! Giving your time can be as simple as spending quality time with your family (with phones away), helping prepare the Christmas meal, or helping wrap/shop for presents without complaining. You could also donate your time through service, by volunteering at a holiday food or toy drive. Your parents are probably stressed this holiday season. How can you help make this time easier for them? Are there extra chores or tasks you know they could use help with? I’m sure you can think of some way you can help your loved ones this season. You could offer to help create/print/mail the Christmas card (I know this is a big job in my house), or you could help do some holiday food or present shopping. ‘Talent’ and ‘time’ overlap especially during Christmas, but like the Bible says, we all have our own gifts that we can use to give to others. These ideas may be the most obvious, but they can make a big difference. Set a goal to go through your closet and donate a bag of clothes and shoes before you get all your new items on Christmas. If you’re looking to give back even more, choose to give a fixed percentage of the money you receive for Christmas to your favorite charity. (Let’s say you decide to give away 20% of your monetary gifts… If you get $200 for Christmas, you’ll donate $40). Set the percentage and pick a charity before Christmas so you have extra incentive to follow through! You could even get your siblings on board to hold each other accountable. I’ve decided to give a certain percent of the money I receive for my birthday and Christmas to my Dance Marathon account. You can read my full post from Dance Marathon last year or read more about the event here, but Dance Marathon at FSU is the largest student-run philanthropy on campus, and last year we raised more than $1.8 million for Children’s Miracle Network and Shands Children’s Hospital. I’ve set a personal goal of raising $1000 by the event on March 2! Make a Donation! You can also choose to ‘give up’ a certain holiday treat, like that yummy peppermint Frappuccino, and donate the money you would’ve spent instead. Think of three ways you’re going to give back between now and January 1. Write them down! Make them your phone wallpaper, hang them on your mirror, or tell someone so you have an accountability partner. Do the things!!! Unfortunately, just thinking about doing nice things doesn’t actually help anyone. Sure, it’s easy to think of ways to help, but I challenge you to pick one thing you are definitely doing to give back this year! Spread the love and pay it forward! Your acts of kindness and service could start a whooole chain-of-goodness. Be the change. Be the spark! Let your giving inspire someone to give something, too. I know it’s all easier said than done, but I really hope this post can be an inspiration for ways to give back this Christmas. Personally, I brought home a whole bag of clothes to donate, and I’m giving a percentage of all the money I receive to Dance Marathon! Everybody talks about the gifts they’re giving for Christmas, but few talk about how they’re giving back. What’s your action plan? How are you going to give back? Leave me a comment below with at least one thing you can do! I’d love to hear how you’re going to take this challenge! I love this post! It’s so easy to get caught up in the presents and getting and forget what Christmas is all about! I always love giving back this time of year. Me too! It’s extra-special this season.